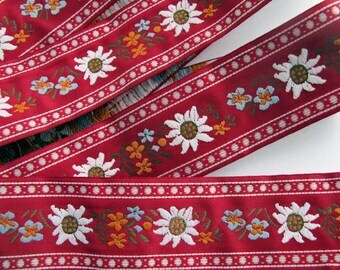 A classic floral edelweiss ribbon with great definition. 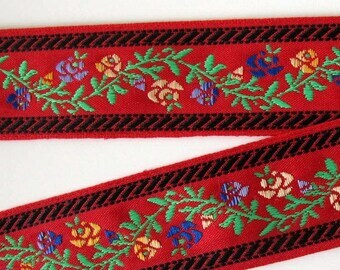 Offered here are 10 yards of a lovely floral Tyrolean Jacquard ribbon. WHITE edelweiss, RED and BLUE flowers, GREEN leaves on BLACK. 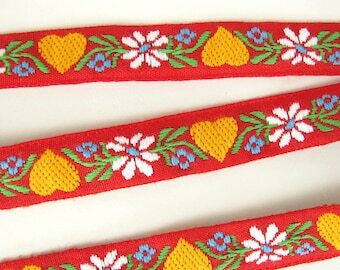 With a pretty WHITE decorative border and with finished woven edges. Let me know if you need more yardage. 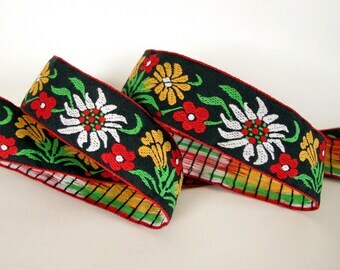 Jacquard trims are woven with multiple color threads on needle looms. See the pictures, I show the front and the back of the trims for your consideration. I ship in the 4 days after payment clearance. Beautiful trim--thank you for great customer service. Good color on this trim. Appropriate rates Washington and Oklahoma State Destination taxes will be added at check-out. All purchases to other destinations are State tax-free. All international orders are subject to the destination country duties, taxes and delays in customs. Payment via Paypal or Credit Card via Etsy Payments is expected in the 3 days after purchase. I also accept Western Union Automatic Transfers for International orders over $25.00 only. Email me for info if you want to use this payment method. 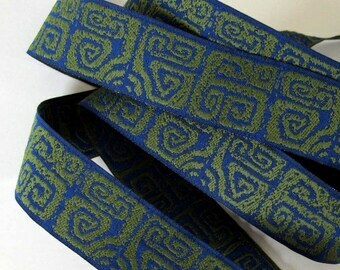 All sales are final on cut-to-order trims, so ask all questions before ordering. All our trims are custom-cut specifically to the buyers requests and these custom cut pieces are not returnable or refunded. I ship To USA and Worldwide. Haberdashery, trims, notions and lace are restricted for import to a few countries (ex: Italy). I will not be able to ship these items to these countries. Please make sure your country is not on this restricted list before ordering. It can be found at the USPS postal website. Cost of shipping is listed on each posting. Appropriate rates Washington and Oklahoma State Destination taxes will be added at check-out. All purchases to other destinations are State tax-free. All international orders are subject to the destination country duties, taxes and delays in customs. Customs and import duties may be applied to International Orders when the shipment reaches its destination. Such charges are the responsibility of the recipient of the order and vary from country to country. Contact your local customs office for details. Customs, Import and Shipping regulations and tarifs are different in each country.